When you are finished with this page, you may also be interested in my Guide to Maynooth (restaurants, pubs, supermarkets). The best shared transportation option between Dublin Airport and Maynooth is the Airport Hopper. This bus runs about once an hour from very early in the morning until 9pm (from Maynooth, opposite the Glenroyal Hotel: see map) or 9:50pm (from the Airport, Bus Zone 16), with travel time of about 50 minutes. The cash fares are E9 single and E17 return (but cheaper if you book online). If you instead want to come via central Dublin, there are frequent buses from the airport to Dublin, both express (Aircoach, Airlink 747) and regular routes (16, 41). Express buses cost more than regular buses but have much more luggage space. Maynooth is about 25 km west of downtown Dublin; you can make the trip by bus from Pearse St/Westmoreland St/South Quays (take 66, 67 or, in the 5–6pm rush hour, 66x), or by train from Connolly/Tara St./Pearse. 66 and 67 buses share almost all stops in Dublin but they start from different points in Maynooth: see map. Note: Both Dublin Bus and Irish Rail change their timetable links frequently (bad Web practice!! ), so if the above links are broken, you'll need to go to http://www.dublinbus.ie/ and http://www.irishrail.ie/ and find the timetables for yourself. Frequency and transit times There are 2–4 buses/hour which take 50–75 minutes depending on time of day (Central Dublin–Maynooth). Trains are less frequent, especially on Sunday, and take at most about 40 minutes (Connolly–Maynooth). Last buses and trains The last Maynooth train leaves Connolly at 23:17 (Monday-Saturday)/20:52 (Sunday). The last regular bus (67) stops at Westmoreland St in central Dublin at about 11:30pm every night. There is a limited bus service after midnight to Maynooth on Friday/Saturday. One-way fares to/from Dublin (after December 2012) The train costs E4.75, while the bus costs E3.30 (66/67), E3.65 (66x), or E6.60 (67n after midnight). Longer term visitors might be interested in a 5-day Rambler card (E23.30), which can be bought in many shops, or a Leap Card (reloadable smart card offering discounts), which can be bought online. I recommend that visitors use a Maynooth-based taxi to come here from Dublin Airport rather than an airport taxi because the driver will always know where Maynooth is, and the fare will be significantly less. The first reason is not a joke: we have occasionally been told of Dublin Airport taxi drivers having difficulty finding Maynooth. 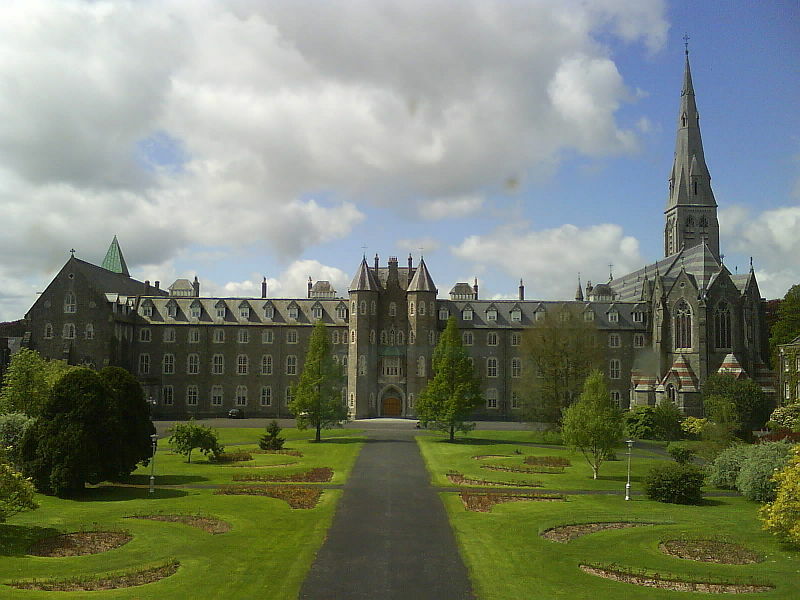 Maynooth taxi drivers all know where the University is, and often even know specific on-campus locations such as Logic House or Conference and Accommodation. Here are a few numbers of Maynooth-based taxis; omit the +353-1- prefix if you are already in the Dublin-Maynooth area. You can prebook a Maynooth taxi for no extra cost with any of the above companies before you fly so that the driver will be waiting to meet you when you arrive; they'll ask for your flight number so that the driver can check for flight delays. If you don't pre-book, you typically have to wait a half-hour or more for a Maynooth-based taxi to arrive. This system isn't perfect, so keep the phone number on you in case you don't see the driver on arrival. If your flight was late and the driver neglected to check this, he may have already come and gone, so you might need to call back to get the driver to return to the airport. If you call one of the above companies from the airport, they'll likely ask if you have a mobile phone to facilitate meeting you. If you don't, they typically suggest a meeting point in the arrivals area (Vodafone shop if Terminal 1: there are seats nearby). There are several reasonable ways of driving from the airport to Maynooth. One route is via dual carriageways (highways), but other routes use narrow winding country roads. Don't worry if the taxi driver takes one of the latter routes! The Maths and Stats Dept: where is it? 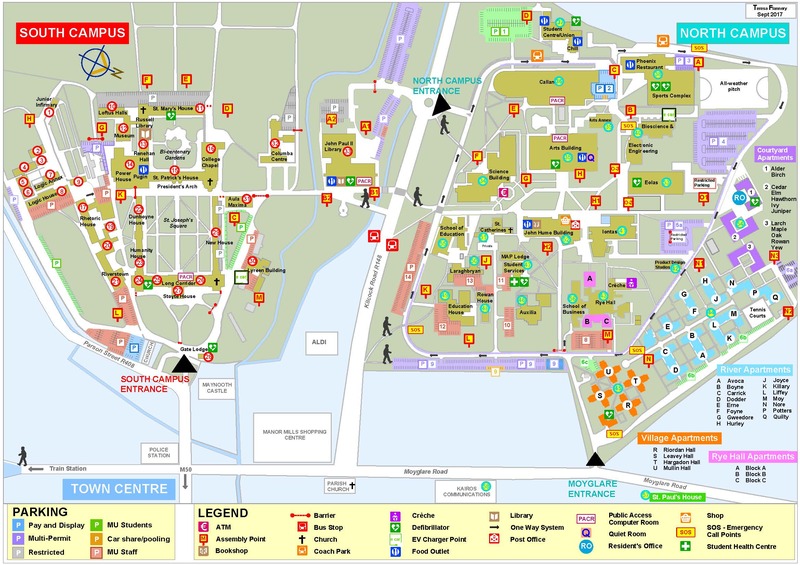 The Department is in Logic House, on the South Campus (number 8 on the left of this map). After entering the main gate of the University, turn left, then take the first left, and follow the road to the end of a playing field and you are at Logic House! On weekdays during most of Semesters 1 and 2, on-campus parking is permit-controlled, except for certain pay-and-display areas. On Saturdays and Sundays, and during holiday periods, the staff/student/mixed permit-controlled areas are free for all to use. Special parking spaces (pay-and-display, reserved, disabled, etc.) are still subject to control. Departmental visitors can contact the Department for advice on parking. My on-campus accommodation: where is it? For South Campus accommodation, go to the Conference and Accommodation Office. This is in the location marked "Long Corridor" on the campus map), under the arch numbered 25 near the South Campus entrance. For North Campus accommodation, go to the the appropriate reception for your accommodation. There are two such offices in the areas marked "River Apartments" and "Village Apartments" on the lower right of the campus map). If it is possible that you will arrive after 23:00, contact Conference and Accommodation before you travel, and they will leave your key with Security at the lodge by the South Campus gate. Here is a sketch of the main roads and some of the landmarks in Maynooth; the railway station and bus stops are shown. The topology of this sketch is correct, but the metric is distorted (for instance, the part below Celbridge Rd/Centra is severely vertically compressed). However it is should be sufficient for finding your way to the Department when you arrive. The main part of MU/NUIM shown is the entrance to the South Campus. North is roughly up. Alternatively, here is a true-scale Google map of most of Maynooth. The South Campus of MU/NUIM is on the left mostly bounded by the canal, Parson St., and the R148.